This bank produced a range of denominations. One of my favourite note designs. The notes are relatively common, and a lot of unissued remainder notes are around. Here’s one for starters. The 1 guinea & half is an interesting small note denomination. 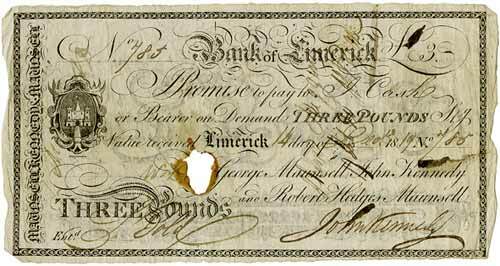 The Maunsell Bank of Limerick notes are interesting as they are an early example of printing on both sides of the note. I attach the reverse of an 1819 25 Shillings note. Last edited by DOC on 08 Aug 2018 19:09, edited 1 time in total. 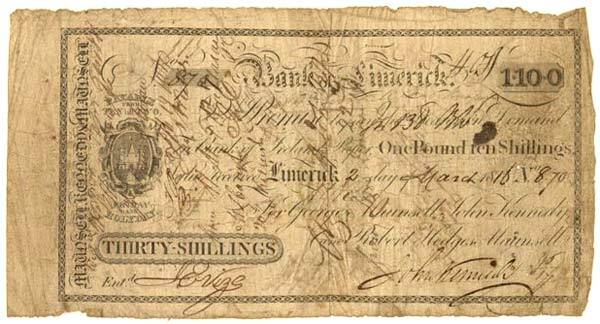 Bank of Limerick £3, £10 unissued notes and a 25 Shilling note dated sometime in October 1819, can't make out the day. An issued 30 Shilling note from 1816, and a £5 note with the reverse design showing thru. This bank issued a good range of denomoinations, with a good solid design and printed on the reverse too. 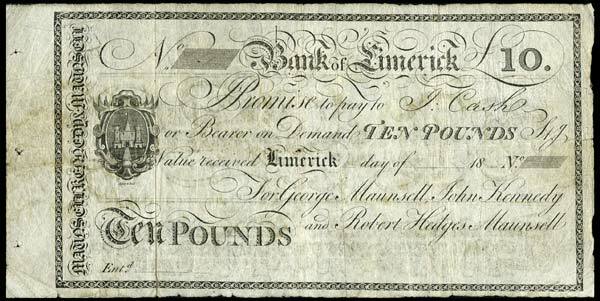 An issued Bank of Limerick 3 Pounder. 14 Dec 1819. I have seen two varieties of Maunsell notes, one with opening hours, the other without. The opening hours in those days were from 10 till two with Friday as a Bank Holiday . I attach an example of a 1 & Half Guinea note dated 24th August 1816 with opening hours. Last edited by DOC on 08 Aug 2018 19:13, edited 1 time in total. I never noticed that on the notes! Very helpful for the customers. This Bank also issued £1 notes. Here is an early example dated 14th Dec.1815 with opening hours. The grade is low but it is the only example of this type that I have seen. Last edited by DOC on 08 Aug 2018 19:14, edited 1 time in total. Here is a £1 note of the more commonly seen type without opening hours, dated 18th September 1819. Last edited by DOC on 08 Aug 2018 19:16, edited 1 time in total. 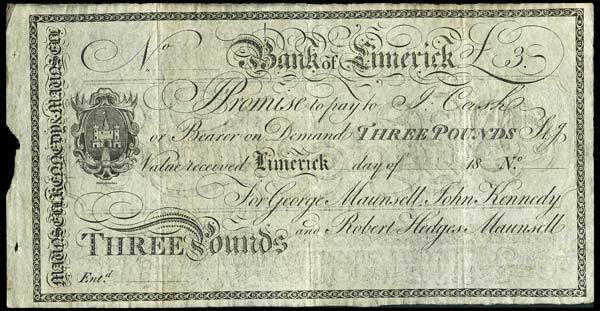 Interesting to see that Paper Money of Ireland describes two types for the Bank of Limerick, Maunsell notes but in a different way. The authors have identified a type with the following promissory statement: 'Promise to Pay the Bearer on Demand in Bank of Ireland Paper'. This type corresponds with the type having opening hours. The second type without opening hours has a different promissory statement as follows 'Promise to Pay to J.Cash or Bearer on Demand'. The two types for the 1 Guinea notes are attached. Last edited by DOC on 08 Aug 2018 19:22, edited 2 times in total. Interesting indeed! 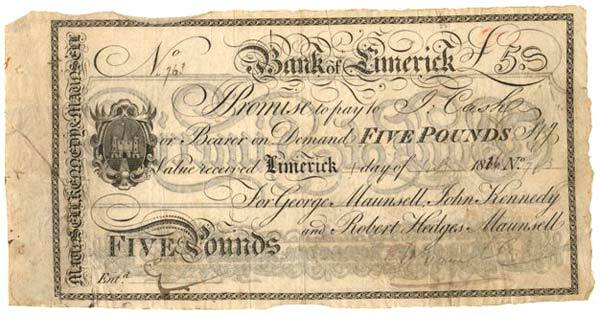 I would guess that the second Type copies the Bank of Ireland notes of the era to promice to pay a named person or bearer on demand, whilst at the same time weakening the 'promice' by removing the obligation to pay in 'Bank of Ireland paper'. 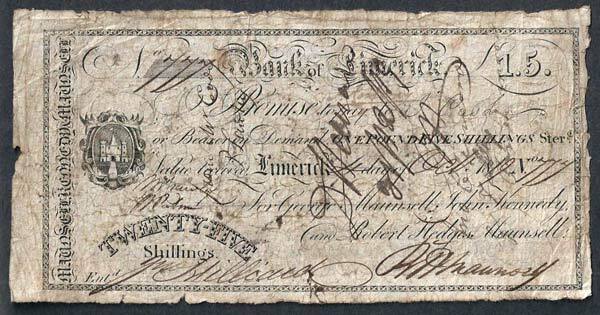 Here is an early type 25 Shillings note from this bank with promise to pay in 'Bank of Ireland Paper'. Last edited by DOC on 08 Aug 2018 19:25, edited 1 time in total. Here is an issued 30 Shillings note of the later type, no opening hours and payable to J.Cash. Last edited by DOC on 08 Aug 2018 19:28, edited 2 times in total. Here is a scarce 3 Guineas denomination from this bank, dated 29th November 1817. Last edited by DOC on 08 Aug 2018 19:32, edited 1 time in total. I suppose these Guinea denominations were very common in their day. Interesting point about the number of higher denomination guinea notes issued by this bank. The serial numbers on the notes suggest that this bank was not a prolific issuer. From observation the higher denominations appear to be rare particularly in issued form. Type A: Promise to pay the Bearer on Demand in Bank of Ireland Paper with opening hours listed. Type B: Promise to pay to J. Cash or Bearer on Demand with opening hours listed. Type C: Promise to pay to J. Cash or Bearer on Demand without listing of opening hours. Last edited by DOC on 08 Aug 2018 19:34, edited 1 time in total. It seems there's a lot still to be discovered about the private bank notes. The subjext needs a good book dedicated just to these banks.